The Solar Radio Microwave Flux | Watts Up With That? Shortly after SWPC dropped on their website their still invisible “press conference” ( I have yet to get the link to audio, even though requested twice from Doug Biesecker) Leif Svalgaard remarked that the 10.7 cm radio flux graph produced by SWPC in that announcement on their web page was “just wrong”. Since 1947 we have routinely measured the flux of microwaves from the Sun at wavelengths between 3 and 30 cm [frequencies between 10 and 1 GHz]. This emission comes from high in the Chromosphere and low in the Corona and has two different sources [although there is debate about their relative importance]: thermal bremsstrahlung [due to electrons radiating when changing direction by being deflected by other charged particles] and ‘gyro’-radiation [due to electrons radiating when changing direction by gyrating around magnetic field lines]. These mechanisms give rise to enhanced radiation when the temperature, density, and magnetic field are enhanced, so the microwave radiation is a good ‘measure’ of ‘general’ solar activity. As strong magnetic fields are located in specific regions that can live for weeks and often reoccur at or near the same location for months [perhaps even years], there is a strong rotational signal in the emission superposed on a solar cycle variation of a ‘background’ activity level. At solar minimum, especially a ‘deep’ one as we now experiencing, the effect of active regions largely disappears and we observe a sort of solar ‘ground state’. As the radio flux measurements [as opposed to the sunspot number] are unaffected by changes of [human] observers and their observing techniques and instrumental and atmospheric differences they may be a ‘truer’ and more objective measure of solar activity [to the extent that we can reduce this complex concept to a single number per day] and the many decades-long flux record could throw light on the important issue of the long-term variation of solar activity. The solar microwave flux is nominally an absolute flux, one solar flux unit defined as [the very small amount of] 10-22 Watt per square meter per Hertz. Making an absolute measurement is always difficult and considerable uncertainty and debate surrounded these measurements early on, before being settled by international cooperative work in the late 1960s [Tanaka et al., Solar Phys. 29 (1973) p. 243-262; http://www.leif.org/research/Tanaka-Calibration-F107.pdf]. By observing the radio flux from supernova remnants [Cassiopeia-A, Cygnus-A, and Virgo-A] one can verify the constancy of the calibration. The longest running series of observations is that of the 10.7 cm [2800 MHz] flux [often simply referred to as ‘F10.7’] started by Covington in Ottawa, Canada in April 1947 and maintained to this day[and hopefully much longer] at Penticton site in British Columbia [http://www.hia-iha.nrc-cnrc.gc.ca/drao/solar_e.html]. The data is available from several sources, e.g. from the NGDC at http://www.ngdc.noaa.gov/stp/SOLAR/FLUX/flux.html, more timely at ftp://ftp.geolab.nrcan.gc.ca/data/solar_flux/daily_flux_values/current.txt. There are three measurements per day with small systematic [and poorly understood] differences. One can either average all three, or as in this work only use the noon value [for Penticton at 20:00 UT, since 1991]. As with all solar indices, there is the issue of the varying distance between the Earth and the Sun. For describing the effect on the Earth’s atmosphere and environment the proper values of the indices to use should, of course, be the ones observed at the Earth, but for studying the Sun, those values must be adjusted to the mean distance [at 1 astronomical unit]. This is not always appreciated and one sees endless discussions about F10.7 changes or flat-lining without the 7% change caused by the varying distance being taken into account. Needless to say, here we use the ‘adjusted flux’. 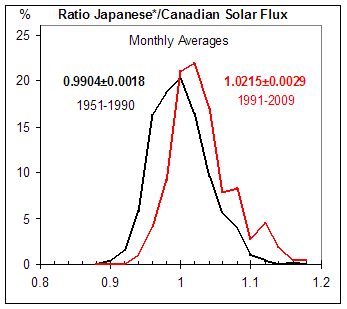 Adding 3% to the Ottawa flux before 1991, rescaling the Japanese measurements to the thus corrected Canadian series, and computing the average flux from the two series gives us the composite series shown in Figure 8 below. All of these adjustments are very small, though, and do not substantially alter any conclusions drawn from the measurements. Although the microwave flux measurements are said to be absolute, a further correction [multiplication by the ‘URSI’-factor of 0.9] is required to get the ‘real flux’. We shall ignore that constant factor as only the relative variation is of interest here. The red and green curves in the composite graph show the Canadian and [scaled] Japanese series going into the composite. On the whole, there is substantial agreement and the microwave flux seems well-determined. 1) The sunspot counting procedure or observers have changed with resulting artificial changes of the sunspot number as they have in the past. 2) Changes in the Corona or Chromosphere accounting for additional F10.7 emission. 3) Livingston & Penn’s observations [http://www.iop.org/EJ/article/1538-4357/649/1/L45/20946.web.pdf?request-id=e22b7626-e93b-4ce3-b6f1-a999655b8888] that the sunspots are getting warmer during the last decade, leading to a decreased contrast with the surrounding photosphere and hence lessened visibility, possibly resulting in an undercount of sunspots. There has been some criticism of SIDC and SWPC recently related to counting small pores, changing the count inexplicably, and various mistakes, but it seems to this writer that these problems would not be serious enough to account for the continuous and progressive drift shown in Figure 11. The near constancy of the flux at minima since 1954 argues against a change of the physical conditions at the source locations, leaving the exciting possibility that Livingston & Penn may be correct. May 14, 2009 in Science, Solar. The watts effect is here. The Cycle 24 plage region has finally produced a small sunspot. It has received the number 1017 by NOAA. Thank you Lief for the post! 1) What changed in the instrumentation or the method used to detect and/or count sun spots in 1989? 2) What, if anything, changed in the Sun in 1989? Also, is there any proxy that might be used to calculate the F10.7 values during the previous minimums to see if the relationship between sun spot numbers and F10.7 values shifted prior to the onset of a minimum? Very interesting article, who would of thought that our Sun can change? Interesting Leif. If Livingston & Penn are correct, then something is shifting as regards the dynamics of the sun. Any hypotheticals on what hotter sunspots may imply about the solar environment, and resulting output in radiation? I wanted to be one of the first to say thank you for your contributions in the comments and even greater thanks for your article. I look forward to future articles. So if they get warmer, could they possibly become invisible to the naked eye? And does this correlate positively or negatively with previous solar minima? Or do we have enough data to know? Thanks for the article and explanation. Yes, there are and we can go back to the 18th century on this, but that is anther article. Any hypotheticals on what hotter sunspots may imply about the solar environment, and resulting output in radiation? As the two sites for measuring are not on the same circle of latitude ( i believe ) can you dismiss this as a reason why the data would not closely correlate ? can you briefly describe the hardware, especially the antenna, used to recieve the emmissions. here on earth, we tend to think of RF as being either horizontally, vertically or circular polarized. I do believe as you describe the emission sources, what we are receiving is “randomly polarized”. could antenna hardware be further refined so as to better categorize the source emission means ? perhaps hotter sunspots suggest that they are originating at a different layer of the suns interior which might lead one to wonder if the sun is going through a more dramatic state shift ? very interesting article – thanks ! The link provided http://www.hia-iha.nrc-cnrc.gc.ca/drao/solar_e.html has more details, otherwise the Tanaka article referred to. Leif Svalgaard: thank for your clear and informative article on solar microwave output. especially the graphs. As a visial minded animal, pictures are more informative to me then words. Now I have a better grasp of your point of view on solar output vs climate. AS to the sunspot descripency over the last two cycles, it would appear that the criteria of observation and count may have changed, most likely in 1978. I many times, have found a slight change in data is due to an “improvement” in data collection technique. THAT was a good read.. But does the last sentence mean to say “exciting”? 1) Could the discrepancy actually be worse than the numbers show? With the advent of SOHO we’re seeing, and recording as spots, fleeting “sunspecks” that would have been difficult to see many years ago. If anything, this would push the curve up, and bias towards a positive anomaly, rather than the negative one we see now. 2) Is the drop consistent enough that you can extrapolate it? If so, does it indicate zero sunspots by around 2014 or 2015? Hmm, my previous didn’t show up as awaiting moderation, so now I’m not sure if it went thru. At any rate, if it did you can delete this one. . . but you have a misspelling of exciting in your final sentence. Bravo. It raises the profile of all blogs to have phenomena explained by a true expert at a level that is near explicable. Three cheers for the interactive forum and four for the teacher. A request: Can we have an article exploring the variation in the power of radiation that is shorter in wave length than the visible? What can we expect in terms of variation in short wave radiation as the spots disappear? Will this affect the stratosphere? Do we track conditions in the heliosphere on any consistent and broad (non-local) manner? Have these conditions shown any relationship to the Solar cycle? Have they shown any patterned or consistent fluctuations in the last few decades (or however long the data covers)? Yes we do. Cosmic rays are measured and can be inferred in the past for thousands of years. Geomagnetic activity tells us about the strength of the solar wind as well, and has been measured for more than 250 years. Yes they have: they vary with the solar cycle. They have shown that the solar wind right now is very much what it was a century ago. But since we seeing a negative one now, that argues against a bias, unless the situation is even worse [as you say]. If we didn’t count the specks we would see even fewer spts. This is all very exciting and we’ll just have to see. Bill Linvingston in an email to me today “Sunspots today are behaving like a Cheshire Cat: the smile is there (magnetic fields) but the body is missing (no dark markings).” I had actually thought about using that in the title of the article, but I didn’t want to steal his ‘thunder’. Extrapolate yurself. It is anybody’s guess. @Leif… A solar sneeze is climate pneumonia on Earth. From your article, it seems that warmer years are for coming. 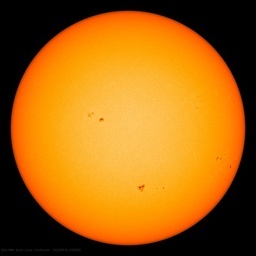 Hotter sunspots, (probable) higher loads of energy the Sun will release. It’s important to know how much energy can be stored by oceans. Thanks for sharing your knowledge, Leif. Thanks Dr. Svalgaard. Just enough dumbing down for this geologist to (mostly) follow. One question: Do you think the change in slope of tail of cycle 23 have any connection to the apparent changes in the nature of sunspots? And if so, what would be your explanation. Hi Leif – that is a great article and I better understand where you come from now for your predictions. So, you expect the next cycle to look somewhat like cycle 20, or worst? Do we observe the same cycles in other stars? Extremely informative. Great science (would not expect any less from the author). Many thanks. So, the leopard hasn’t changed his spots. They’ve just bleached out so we can’t see them anymore. Jeez! Read with fascination if not full understanding, Leif. Thank you. Would you, or your 11 years old grandson, tell me (relative to these words above “…that the sunspots are getting warmer…”) the temperature of a sunspot and the temperature of the surrounding solar surface? yes, they do correlate very nicely, until recently … excuse my attempt at a question that answered itself, upon reflection ( wasn’t the best wording either ). Cracking analogy. I don’t want to appear a numpty, but if the “spots” are there (magenetic fields) but missing the body (no dark spots) could not only imply, as suggested earlier, that the “spots” are hotter thus harder to “see” but surely also the Sun could be “cooler”, closely matching the temperature of the spot, too? suggesting a “cycle-related oscillation in umbral field strength and intensity” and arguing against the proposed steady trend. So there seems be no basis for the vanishing of the sunspots in 2015 as worded by Livingston & Penn! Certainly there is a vanishing, but not linearly. I’ll join many others here in thanking Dr, Svalgaard for such a lucid explanation. Now for a question that is probably outside his field: It seems that the geomagnetic field has been losing strength for some time and there has been speculation that it is about to flip polarity again. Any possible connection? Well if Radio flux is proportional to Sunspots, then one would expect the baseline of all the Radio flux minima to be identical, would you not? After all, you cannot have a negative number of Sunspots. yet GONG images from 15 May: BB, UD and ML show blank. Not even a blurry plage today. Leif thank you for your always informative posts, and thank you for tirelessly answering the same questions in good spirit!! >>15 May: BB, UD and ML show blank. Not even a blurry plage today. What are they counting – pinpricks? Or do I need stronger reading glasses? Maybe some of those dead pixels? Thanks, Leif. You’ve shifted my focus. Is it then complete speculation to suggest that during historical solar minima, some sunspots were not counted because the spots warmed up to the extent they couldn’t be seen? Overall, it’s kind of reassuring to know there’s still some magnetic activity going on (10.7cm) even if there’s a lower amount of sunspot activity to show for it. Very clear exposition — and educational for me. Please write again. I guess ‘time will tell’ if the ratio of spots to flux is something that also cycles on some time scale. I apologize, but I still see a ‘gross’ visual correlation between cycle ‘energy under the curve’ and lagging earth temperature (which backs up a more detailed math model I did that says the same — without proposing a mechanism). Because of your comments over the previous months, I tentatively believe the sun’s absolute measured output does not vary sufficiently to explain that. In that connection, its great to have a credible Solar Scientist posting here (and at CA) — who is willing to educate ‘the masses’ of climate aficionados (like myself). Anyhow, your exceptionally clearly written PDF has become a welcome addition to my permanent electronic library. Are sunspots tracked at a wavelength outside of visible light at all? IR, UV etc. If you compared those counts with visible light counts you could tell if there were “invisible” spots. i’m still trying to get my head around the relevance of this information, vis a vis the infinitesimally small period of observation against the projected lifespan of the sun. It’s to me like watching a movie frame by frame. Whilst one frame might be still part of a current scene, the next frame can be part of the next scene of the movie. Taken like this the entire film content gets completely obfuscated. how much do we understand of the processes that create the variations in the magnetic field, and why the minimum flux seems to be a constant. could some error or factor in the distance adjustment of 7% contribute to the variance we are seeing? I note that CME’s during mimimums seem to be much more powerfull than during periods of intense solar activity, what process could explain that ?? I’ll do a little extrapolation on my own: The contrast limits (the L&P) seems to have dramatically nose-dived after mid January 2009. To the point where even SOHO is being strained. A year ago, contrasts of 4to1 and better on SOHO were the good stuff. Today, 1.5to1 is a fleeting high point on days where 1.05to1 is the norm. We could be having a series of spots occuring at the low range of L&P curve, or it may have tailed over/accelerated. Enjoy any sunspots you may see. No telling when they will return, as that is not a subject that L&P sheds any light on. You need an image processing program. Take the GONG images and apply an exponential stretch, or something similar. Your jpeg scale is 0 to 255. You need to highlight differences of 10 or less in greyscale. Pixels of 237 are not normally distinguishable from adjacent pixels of 244, 255 being totally white, 0 being black. And even at that, 1.029 to 1 is a poor contrast even when stretched. Thank you for that very illuminating article, Dr. Svalgaard. I believe I have a better understanding now of your stance of TSI nonvariability. I am left with one question: if the 10.7 cm radio flux graph produced by SWPC in that announcement on their web page was “just wrong,” what is the correct one supposed to look like? Dr, Svalgaard, thanks so much for such a clear explanation that has taught me more about the solar radio microwave flux than I had ever imagined there was to know. Let me take the liberty of asking a few questions. On the appearance of sunspots, my understanding is that they occur when magnetic flux tubes in the convective zone extend through the sun’s visible surface. So if we are seeing very few sunspots at present, this means that very few magnetic flux tubes are emerging through the surface. But does this mean that there is any less magnetic flux activity or merely that the regions of magnetic flux remain below the visible surface? Since sunspots are cooler than the rest of the surface, does their absence make a measurable difference to the observable temperature of the surface, or would this difference be so small that it would be swamped by other variations? Can differential rotation of the sun at different lattitudes account adequately for the waxing and waning of sunspots over the circa 11-year solar cycle? And lastly, what other more speculative hypotheses (besides the three “obvious” ones you listed) have been put forward to account for the change in the relation between the sunspot number and the microwave flux over the past 20 years? I know the late Dr. Theodor Landscheidt’s theories are frowned upon in polite circles, but is there any chance that planetary motion is involved? Or could the sun be “breathing” as in going through a cycle that repeats over a timescale on the order of centuries due to its internal dynamics. I hope you’ll forgive me firing off a bunch of questions that may have obvious answers to anyone who has studied solar physics, and please don’t feel under an obligation to provide lengthy answers. But I think this post is a golden opportunity to clarify some basic points on a fascinating subject that is a bit of a mystery to the laymen among us. Very nice article. The next year should be interesting – we should see how the relation evolves as the flux returns to the level where the ratio can be calculated again, and also if that flux increases slowly or quickly. It would be interesting to review your data in terms of the plasma model, as formulated by Hannes Alfven and his successors. I personally am not technically competent to do so, but maybe Anthony Peratt, or Wallace Thornhill could be approached? Interesting post! Well we live in interesting times, let’s see what we learn from the next sun cycle! Many thanks to Dr. Svalgaard for this informative article. I would like to add my request to others posted here that Dr. Svalgaard post more of these well-written and informative articles dealing with solar phenomena. As we all watch (with different levels of technical solar understanding) this upcoming solar cycle unfold, Dr. Svalgaard’s deep but understandable articles would be most welcome. Obviously, on this site there are many who want to learn and would benefit from Dr. Svalgaard’s expertise. Leif, does your prediction for the sunspots in the coming cycle account for the invisibility of some of them? In other words, will you have to change your estimate because some of what you expected will only be plage areas? What part of the stratosphere are you talking about, tropics, polar, and at what height ? Leif – also add my appreciation of your lucid work. 1. There is variation in solar output over the 11 year cycle with TSI being 0.1%, and UV varies by more – at 8%? and also the aa index and radio signal drop down in the cycle troughs – we can also see a variation of a few percent in the modulation of galactic cosmic rays. These are the factors we can be sure about. 2. There is a growing consensus that over centennial time scales the TSI has not varied in the sense that it could have been lower in an absolute sense, and likewise the magnetic flux and the UV flux – this coming after a decade or more of studies that seemed to show a past period of lower TSI by 0.3% (Lean and others); though there is less consensus that the magnetic field has not been lower because there is radio-isotope data that appears to show higher levels of cosmic ray penetration (the counter argument being that the isotopes of beryllium, for example, could show fluctuation due to other environmental factors). 5. Thus, when we consider the Maunder Minimum, we should be thinking of the CUMULATIVE effect of all those years at the minimum – whether it be 3% more cloud, 0.1% less TSI and 8% less UV………….and given that the MM was only 0.5C lower globally, it is not that hard to imagine these changes being enough – espcially if there are shifts in the jetstream, polar vortex, Arctic oscillation and the storm tracks across the Pacific and Atlantic. 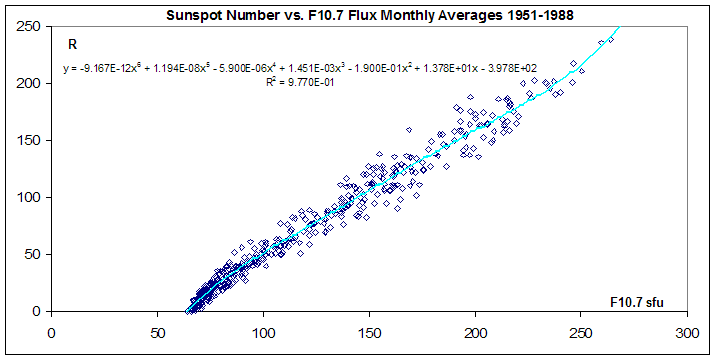 Is 38 years enough to say there is a correlation between Sunspot Number and F10.7? How do we know those 38 years weren’t the anomaly? Maybe when F10.7 flux and sunspot activity align it creates a forcing effect. Are scientists confident enough to say that variations in F10.7 are the result of sunspot activity? If the correlation is correct but sunspots are getting warmer and decreased contrast is leading to undercounting, what does that mean? Is it the same thing that happened in previous minimums? Bottom line, are we getting warmer or colder? If sunspots are a bit warmer, does it follow that the sun as a whole will also be warmer? Or could warm sunspots indicate a sun that overall is less active? We presently think of the Maunder minimum as a time when the sun was cooler, as marked by Be10 and C14 proxies, vs. the Medieval Warm period. Should we revise our thinking? Are the Be and C proxies no longer valid for some reason? Thanks for the great article Leif, interesting stuff indeed. I have one question along a similar theme as some other posts here. If the Sunspots are getting brighter, presumably they are hotter. Would this have an impact on the angular momentum of the Sun (my naive thinking using a convection analogy: hotter=lower density). That is, would it be reflected in a higher/lower rotation rate of the outer layers – can we measure this? “You need an image processing program. Take the GONG images and apply an exponential stretch, or something similar. Your jpeg scale is 0 to 255. You need to highlight differences of 10 or less in greyscale. 200 years ago a solar observer could not have done that! What was the average image diameter of the sun projected on paper by a telescope in the 1850s? Our modern images are large and our instruments can zoom in on extra detail. If you run Carsten A.Arnholm software “Solar Simulator 2” you´ll see what happened: The Sun changing direction around the barycenter. The descending part of Cycle 23 was clearly telling us that we were headed toward a quieter Cycle 24 which many of us, or at least the planetary relationship believers, already knew about. The explosive nature of the declining part of Cycle 23, as in stronger proton flaring etc…, was interrelated with the overall nomenclature of the solar magnetic field. The polar readings were considerably weaker than what they should have been and this was a clear telling sign of how the cycle to cycle transition was not behaving as usual. If you can use the term usual with as little data as we have. And just to throw out some common sense which might bug some of the more astute “science people”. The solar cycle is related the changing interacting relationship between the poles. This is why we see it behave somewhat like an accordian’s movement (tilted), with the stronger polar magnetic field readings preceding the stronger lower latitude readings, sunspots , C-Holes ( Or Stanford Mean Readings). Now we know that when the polar strength becomes equal we increase the chances of solar eruptions, coronal holes. So coronal holes are part of the solar cycle development process. And this is why Jack Eddy found out that there was an absence of the northern lights during the Maunder Minimum. Because the coronal holes had to have disappeared. At least for a while at the lower latitudes. And this is why I believe that my thoughts from as far back as fifteen years ago are correct. That this minimum will be slightly stronger than the Dalton Minimum because we are still seeing the presence of coronal holes. So Cycle 24 will not be a Maunder Minimum like cycle. And the latter was most likely preceded by a time when the polar field strength was stuck in a much higher continual state, not a much lower state. Even if the current exact opposite state is having a diminishing effect upon the upcoming cycle itself. Thank you, Dr. Svalgaard. I read here often that many ascribe to your view of solar variability. (Or perhaps I’m inferring this incorrectly) Does a summary of your view of cause for the warming/cooling of climate exist, or will you post it here? Thankyou for your professional demeanor and above all, your patience. Two points of interest: Ref. Fig 11 composite. 1. To my eye there appears to be a different noise signature (periodicy-frequency) in the 19-21 solar cycle envelopes as compared to the cycle 22-23 envelopes. Any comments? Are these type of metrics considered for measurements of solar systemic parameters? Leif Svalgaard, yes, please. Another and another article. Thanks to you and Anthony and WUWT commenters for a uniquely informative blog. I especially enjoyed contemplating the possibiliy that: “the sunspots are getting warmer during the last decade, leading to a decreased contrast with the surrounding photosphere and hence lessened visibility, possibly resulting in an undercount of sunspots.” This idea points us more towards rethinking the TSI during the Maunder Minimum–and, even better, suggests more articles on the complexity of our climate sysem. What does Earth do with all that TSI? It’s not enough anymore to simply shout out for sunspots– or the sun as the “driver” of climate. It might be the fuel, richer or leaner at times, but the car’s engineering and its various drivers tell us much more about its performance. So, if I’m reading this correctly, I could be correct than when I half-jokingly referred to SC24 as the Plage Cycle, and that the difference in SC23 between F10.7 values and spots observed and counted might have been a precursor of what we’ll see (or not see) in SC24. By that I mean that in SC24 the values in F10.7 could be much higher than (observed) sunspots. Thanks for excellent insightful article. Here we define the SSC index as the product of the amplitude by the duration time of each storm sudden commencement. A wavelet multi-resolution analysis of yearly means of global temperature, radiative input and SSC index time series since 1868 is performed. It is found that for time scales larger than 60 years a 70 % of the long-term NH change in earth surface temperature might be attributed to SSC index and the remainder 30 % to solar irradiance. May I encourage finding an expert to post a similar article on the sun’s magnetic field variations. Does the integral of F10.7 above your green minimum line to F10.7 correlate with corresponding integrated thermal changes in earth’s ocean and atmosphere about the average? Nicola Scafetta proposes a model of solar activity on earth’s climate/ temperature driven by variations in the sun’s motion around the solar system center of mass. See Scafetta’s presentation to EPA, especially slides 65, 66. I’m not sure if I would call the fact the Livingston & Penn may be correct ‘exciting’. I’m hoping they are not correct, I have no desire to enter a Maunder type minimum during my declining years. It’s bad enough that the Mayan/Olmec end of the next 52,000 years cycle is about a month after I’m supposed to retire, but thinking that my retirement may end up being in a new ‘little ice age’ is not pleasant. Amazing picture none the less. Thanks for this great article guest piece Lief. Well done and keep it coming. Which is the better indicator of natural variation in TSI — SSN or 10.7 cm flux? Or what about CR flux? Of course, we can measure these directly — now — but in terms of historical sun-climate relations it might be useful to know this. For instance, and please do correct me if I’m wrong, but your historical TSI series is based, if I’m not mistaken, upon SSN. Now I know you’ve adjusted historical SSN’s, but haven’t looked into how you did it, e.g. whether 10.7 cm flux was involved. So maybe you’ve done all this already, but I was just thinking that if 10.7 cm flux is a better indicator of TSI than SSN, then using it somehow in calibrating/correlating the main historical record we have — SSN, at least as far as human observed data is concerned — would seem an obvious thing to consider. Again, very nice. I especially noted your observation about where the data analysis ended, and the speculation began. Great article. Let’s keep monitoring the F10.7 radio flux to see if it continues rising as expected (seems to be). I guess the good thing is that there is going to be a solar cycle 24 after all and we are not looking at the cold of the 1690s. I like this comment and the two new very active regions on the Sun (producing barely visible sunspots despite being more active than anything seen in a few years now) seem to reinforce the comment. Thank you for a well written post, Leif. This material is very interesting indeed. One has to wonder what the implications are if Livingston & Penn are correct. If so, are there any theories at all as to how long the effect will last? Dr. Svalgard: thanks very much. Clear, methodical, modest (qualifications and cautions to help readers not infer too much). Makes the conclusion all the more impressive: something has changed. Probably the Sun but we don’t yet know. We do know that we can’t just blithely count Sunspots and assume they’re a “true” proxy for the 10.7 cm flux levels. Per Penn & Livingston the magnetic fields of sunspots have been decreasing while the temperature has been increasing that may indicate internal dynamic changes are occurring in the sun? Thanks to Lief for such a good work. Thanks David Hagen for the link to Scafetta´s PP. It is time to revisit Jose, Shirley, Fairbridge, and others. Well Dr. Svalgard, I can’t say that I have much of a clue as to what that is all about; but it sure does look like very nice data of whatever is being depicted; and as you say, it does seem to give some good input to what goes on on the sun, that we don’t often hear about. So you have sent me scramblng to read your text in detail, and try to digest it, and dig into some background of this kind of phenomenon. It is nice to see data, with good agreement between different groups of researchers. Thank you for taking the time to present this for us; and in such a readable way too. Now If I can figure out how to get my computer to make me a decent copy of this report, I can find a quiet corner to try and digest it. As you point out, the constancy of the lows is very impressive. How nice it is to have such a long record of what looks like clean data without a lot of hiccups/accidents/mistakes, and the like that sometimes seem to spoil otherwise good data sets. One question: the cyclic curves such as your figure 1 show a lot of “fur” on the tops of the peaks, which seems to diminish with signal amplitude. Whenever I see such signals; I am always curious as to how much is “noise” and how much is real signal. So is the 27 day running average the “real” signal, and the fur just measurment or instrumental noise; or is the fur real data too ? The slope of what? F10.7 or SSN? In any event, the downslope seems pretty much the same in all cycles. It is the upslope that is different [big cycles rise fast]. Same Bill Livingston has shown that the surrounding surface has no change in temperature. but surely also the Sun could be “cooler”, closely matching the temperature of the spot, too? So there seems be no basis for the vanishing of the sunspots in 2015 as worded by Livingston & Penn! Certainly there is a vanishing, but not linearly. No linear trend should be taken too literally. SSN does not go negative. All L&P are really saying is that there might a lot fewer visible spots. the geomagnetic field has been losing strength for some time and there has been speculation that it is about to flip polarity again. Any possible connection? Just about in 500 years… No connection as far as I can see. Yes, and that is what we observe, just check Figure 1, where I went to pains [green box] to point that out. They measure the full-disk [Sun-as-a-star] radiation. It is, but a very reasonable speculation, and may very well be true [my money is on that it is]. Leif at his best, superior data analysis. To WuWT; Say Anthony, if you hemmed and hawed for several microseconds before agreeing to let Dr Leif Svalgaard write an essay for us all here; you might want to consider a brain transplant; and get one of those newer high speed multicore models; so you can think quicker ! I was able to get the PDF file and print my self a nice clean copy of Leif’s Essay. This is no small office memo that Dr Svalgaard has dashed off for us here; he has put a lot of work into this. It’s extremely readable; and oriented about at the right level for us lay folks; and yet with a proper level of rigor as well as caution. I’m an old believer in the notion that there is no such thing as too much information; and it is always exciting to see stuff that is out of our normal range of experiences. So I hope you will be more responsive in the future, and not dilly dally around next time Dr Svalgaard has something else interesting to pass on to us. what a nice way to head off into the weekend. Thanks a lot Leif. All good evidence is grist to the mill. I’d love to see a general piece from you about the Sun and everything it puts out, rays, particles, magnetic waves, whatever. It looks to me as if the F10.7 curve is on a very slight uptick, as if it may have hit minimum around 2008.9. Any comments? Is this compatible with the sunspot record? Lief, thanks for the posting. I am trying to remember another posting on WUWT several weeks ago . It showed sunspot numbers verses global temperature. The phasing changed the the 80s. The temperature lagged sunspot numbers and then changed and the temperature led sunspot numbers. It would seem unlikely that something on earth would cause this shift; particularly, since the change was most visible at the time of solar minimum. It is a pure guess;but, something basic may have changed in the sun. Thank you so very much for your article. I have learned a lot in reading this concise article. I was most impressed that you included reference to the shift in F10.7 vs. SSN, to the observations of Penn and Livingston. It is such a pleasure to learn from a scientist that explains not only what is known, but what is unknown. Many of todays “scientists” seem to go off in directions based on hypotheses stacked on hypotheses stacked on hypotheses, and in the end are certain of their conclusions (usually disastrous). You, sir, are an example of the finest in Science. Again, thank you. That’s all very interesting, but most of the article has not been connected to what parts of the prediction graph are “just wrong”. * The starting point of the graph is below the latest measurement; is that starting point wrong because it is below all the measured minimums? * Is the width of the prediction curve too wide or narrow? * Is the leading edge of the wrong shape? * Is the trailing edge of the wrong shape? * Is the peak too low or too high? As you can read in James Shirley’s work, in 1989 the sun changed its path around the barycenter from counterclock wise to clockwise…. 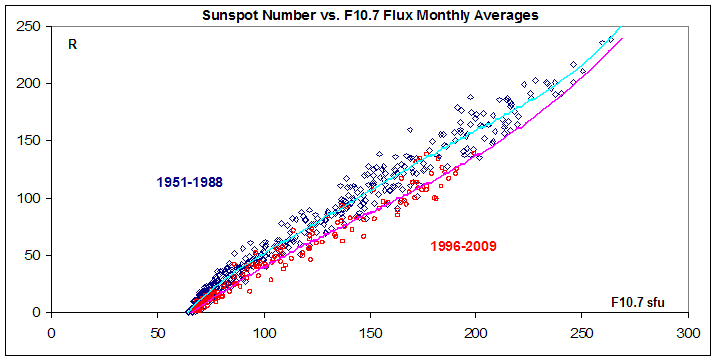 Leif, on your updating plot of solar indices, what is the new ‘MF’ data source? The last point on your 10.7 cm plot appears to be about 77. Penticton noon ‘adjusted’ for the last three days was 75.5, 75.3, 75.5. Are you using Penticton data or something else? Sorry if these are FAQs, but I haven’t seen the answers so far. As I understand it our star is a G2 class and there are 100 million similar stars in our galaxy. Do we believe G2 stars behave broadly the same? If they do is there a way to analyse the G2 stars and effectively use their distance from earth as a way to travel back in time and see similar data that would give us an opportunity to have a real time historical view of key data (such as radio microwave flux) over millenial timescales? Thanks for the article. I always appreciate your clear, brief, logical writing, beautifully-constructed graphs, and simple argument. Over the months (has it been years now? ), you’ve helped clarify many technical issues to this non-technical reader. Thank You for the reference. It’s going to take a while to absorb it. It appears that James Shirley got the prediction right; he was just off a few years on the timing. However, the article does not seem to shed any discernable light on the relationship between solar activity and terrestrial temperatures. Solar activity appears in regular cycles, but earth temperatures do not seem, upon casual inspection, related. Logic would seem to indicate that the sun must be the primary driver of the earth’s climate, and yet we have no smoking gun, best I can tell. I, for one, do consider it exciting to think that we will be getting a more accurate idea of how the sun operates. Methinks we need to correct some inaccurate concepts and assumptions. In my work, I practically salivate when someone brings me a nice, juicy anomaly. Thanks to Leif for an excellent article. Paradigm shift in progress apparently – “exciting”. Too few spots now, or too many in past, or maybe just too much reliance on spots as indicator of solar state. Perhaps spots are just occasional phenomena on the solar surface, in line with the brief, 400yr, consistent observational record? Plages still seem likely, or maybe even they may disappear too. If we redo the past record, ignoring individual spots, but counting groups and associated plages, what predictions can we come up with for the next cycle, and the projected TSI, and other radiation emission levels? Solar activity appears in regular cycles, but earth temperatures do not seem, upon casual inspection, related. My gut feeling is that the overall thermal energy of the Earth is high enough it does not respond to changes in input that quickly. The changes in input, however those changes occur, are simply taking place too fast for the earth to undergo much heating or cooling. It’s only when there are looong term changes/trends that we can perceive the impact here on the surface. By long I mean 30+ years. If I had the time, and the math skills, I love to work out how long the Earth would take to reach equilibrium with it’s environment if the Sun’s output dropped 5%. Great article … I look forward to your future efforts. how much do we understand of the processes that create the variations in the magnetic field, and why the minimum flux seems to be a constant. could some error or factor in the distance adjustment of 7% contribute to the variance we are seeing? We have a ‘gross’ understanding of how the magnetic field is generated [or rather ‘amplified’]. There are no errors in the distance adjustment. if the 10.7 cm radio flux graph produced by SWPC in that announcement on their web page was “just wrong,” what is the correct one supposed to look like? I apologize for not really addressing this yet. Based on the behavior of the F10.7-SSN relationship up to 1991 [which has been adopted by many ‘official’ agencies] you can calculate the F10.7 flux from the SSN [and the other way too]. According to that formula, the SWPC curve is simply wrong [I’ll later on make a graph that compares those curves]. On the other hand, if that relationship itself is changing, then it is hard [impossible?] to say what it ‘really’ look like… [this was the real real for my post]. if we are seeing very few sunspots at present, this means that very few magnetic flux tubes are emerging through the surface. But does this mean that there is any less magnetic flux activity or merely that the regions of magnetic flux remain below the visible surface? The picture is a bit more complex than that [to say the least 🙂 ]. I think about the same amount of magnetic flux is erupting as earlier, but that the flux is not being ‘compacted’ enough to form the strong fields [flux per unit area] that manifests themselves as sunspots. The area covered by spots is so small that it makes very little difference, hardly measurable in TSI. It has something to do with the generation of spots, but is not the whole story. One can construct models that can reproduce the solar cycle [note: this is descriptive, not necessarily predictive]. but is there any chance that planetary motion is involved? Or could the sun be “breathing” as in going through a cycle that repeats over a timescale on the order of centuries due to its internal dynamics. Just as the Earth’s climate has cycles of internal origin, so may the Sun’s. Planetary motions have always fascinated solar researchers and the idea surfaces from time to time. The problem is that the tidal forces involved are so small [Jupiter’s tide on the Sun is half a millimeter high] and that the planetary motions cannot explain the most important aspect of the solar cycle: the reversal of the magnetic field. My prediction is rooted in the polar magnetic field and strictly speaking only pertains to the amount of magnetic flux, not really the SSN. Under the usual assumption that there is simple proportionality between the magnetic flux and the SSN, then one can use either one. If this relationship breaks down [as L&P suggest], then the prediction is for flux, not SSN. If we take my prediction to be SSN = 72, and use the ‘classical’ relationship between SSN and number of Groups [or active regions, AR], namely AR = SSN / 12, the I predict 6 ARs, whether or not their spots are visible. It has not been shown that any of these changes have anything to do with climate, and the CUMULATIVE effects even less so. When you heat something up, it starts to radiate more and cools down again. But why is everybody so snookered by the idea that these solar effects MUST be important, SOMEHOW? We have 62 years of data, not 38. Sunspot activity itself is not important, but the magnetic active regions are, and for those we are very confident about the effect on F10.7. If the correlation is correct but sunspots are getting warmer and decreased contrast is leading to undercounting, what does that mean? Is it the same thing that happened in previous minimums? It means that the Sun is as active as before [in terms of magnetic flux], but the flux is a bit more spread out, so doesn’t show itself as spots anymore, so we counf fewer spots, but we see the same activity. Bottom line, are we getting warmer or colder? Solar activity has little to do with the climate. If sunspots are a bit warmer, does it follow that the sun as a whole will also be warmer? Or could warm sunspots indicate a sun that overall is less active? The effect on the Sun overall is very small. We presently think of the Maunder minimum as a time when the sun was cooler, as marked by Be10 and C14 proxies, vs. the Medieval Warm period. Should we revise our thinking? Are the Be and C proxies no longer valid for some reason? You should revise your thinking about the Sun [and us] being cooler. The other proxies are still OK, if calibrated correctly, which some of them are not. angular momentum of the Sun (my naive thinking using a convection analogy: hotter=lower density). That is, would it be reflected in a higher/lower rotation rate of the outer layers – can we measure this? The rotational angular momentum [AM] of the Sun cannot change [excpept by very slow tidal and magnetic braking over eons]. The moment of inertia [IM] can change by moving stuff around. When an ice skater slows down by stretching her arms out, she changes her moment of inertia, and since her angular momentum does not change, the speed of her spin slows down: AM = IM * Speed. through the years 1989 to 1991, the Sun’s motion will be retrograde relative to the solar system mass center. The weak polar fields told us that several years ago. The planets have nothing to do with that. The rest of your comment is ‘not even wrong’. Does a summary of your view of cause for the warming/cooling of climate exist, or will you post it here? I may have posted that [in fragments, perhaps] on several occasions, and the viewpoints are so political that my opinion can hardly make a dent in people’s entrenched views. Fig 11 composite. Fig. 10, perhaps? The ‘noise’ and variability is highly variable themselves 🙂 and do not seem to have any stable relationship to anything. This idea points us more towards rethinking the TSI during the Maunder Minimum–and, even better, suggests more articles on the complexity of our climate system. What does Earth do with all that TSI? I mean that in SC24 the values in F10.7 could be much higher than (observed) sunspots. That is what it looks like, so far. Some people think so, other do not. My own opinion is that it does, but in a very small amount [less that 0.1C for a cycle]. Nicola Scafetta proposes a model of solar activity on earth’s climate/ temperature driven by variations in the sun’s motion around the solar system center of mass. People seem to ‘rediscover’ [or trip over] that seductive idea from time to time. At least Scafetta is scientifically honest and ascribes any planetary influences to tidal forces. There forces are there [do not violate physical laws], but are VERY, VERY small. Then one can discuss forever if there are amplifying factors or ‘feedbacks’ or trigger effects, or whatever. That discussion is legit and can be kept within science. The planetary nonsense begins when people realize that tidal forces are too small and invoke unphysical mechanisms to bypass that problem. Even Shirley [who was referred to] warns his followers not to invoke the unphysical spin-orbit coupling. CR flux is a second order effect of solar activity and is smoothed over the whole heliosphere. F10.7 is a good proxy for the EUV [another article on that may be in cards], and EUV determines the conductivity of the ionosphere which we can infer back to 1722, hence we can ‘correct’ the SSN to match under the assumption that the correlation in Figure 9 holds true, and from that reconstruct TSI. If L&P are correct, the correlation may not hold true at all times, and I speculate that it does not now and did not before ~1710 [hence the Maunder minimum in observed spots, but not in the solar wind]. The cyclic curves such as your figure 1 show a lot of “fur” on the tops of the peaks, which seems to diminish with signal amplitude. Whenever I see such signals; I am always curious as to how much is “noise” and how much is real signal. So is the 27 day running average the “real” signal, and the fur just measurement or instrumental noise; or is the fur real data too ? It is a common property of many ‘natural’ time series that the variation increases with the level itself, and in this case that is so. The ‘fur’ is not noise, but real solar variability [e.g. recurs every 27 days, see the spikes in Figure 2.
if Livingston & Penn are correct. If so, are there any theories at all as to how long the effect will last? Last time it lasted 70 years, perhaps. I would say it fits, so far. it is a pure guess;but, something basic may have changed in the sun. There are basically 2 views of the earth – it is an engine, driven by solar energy, or it is a growing baby, feeding off a rather neurotic and stressed mother. Another way of putting this is that we live in a lawful universe, that is predictable on the basis of the prior condition of the universe, or that we have an infinite universe with infinitely variable local conditions that therefore have no predictive ability over anything in time or space. One of these views says God cannot exist, and the other says that science will ultimately tell us nothing. The conclusion I am coming to is that the sentence above is the truth. The present posting is a prelude to a posting that explains where the SWPC goes wrong. That is the Sun’s Mean magnetic Field [in arbitrary units]. The MF is a measure of the average magnetic field near the central part [about 20% of the area] of the solar disk. Its sign matches very well the sign of the interplanetary magnetic field at the Earth 4 1/2 days later, and is some kind of measure of the ‘strength’ of the coronal holes near disk center. It has been steadily decreasing as yo can see. The plot will always be about a day behind. The last point is often an estimate based on the 1700 UT value and on values for several other observatories around the world. When I get the official Pentiction value I adjust my estimate accordingly. So, don’t take the last data point as Gospel truth. Yes an no. We are looking at other ‘sun-like’ stars and they do show similar variations as the Sun [~10 year period etc]. But we only see each star at a moment in time, so we have to look at very many stars to get a good sample, and there are simply not enough sun-like stars close enough [and hence bright enough] to get a good reading. So we only have a handful such cases [and it takes decades of tracking to get the time history]. Some time ago we thought we had located a good sample of such stars, but they turned out to be a bit more evolved in their life and not sun-like ‘enough’. Perhaps there isn’t any of note. But why is everybody so snookered by the idea that these solar effects MUST be important, SOMEHOW? The sun god was the main god of all our root cultures, and this is carried through with our myths and our fairy tales and childrens’s songs. It is the sun that ripens the wheat, that chases the night, that nurtures. Thus people who have not delved in the subject, unconsciously need it to be central in any discussion of weather and climate. Great article! The Livingston and Penn paper, for one reason or another, made one of the strongest impressions I have had here on WUWT. It seemed to me that the authors had become aware of something, thought through what the implications of the findings were, and published the results. Perhaps the impact of the paper (on me) was due to the fact that authors weren’t trying to prove they were right about something, they didn’t seem to be doing a one up or that they had some agenda or anything like that. I was left with the feeling that, although the reasoning from observations to implications appeared sound and straight forward, the authors themselves were somewhat skeptical about the conclusions that were logical based on the measurements they had made. I guess that it created a disconcerting credibility in my mind, as I am more used to those who take a stand and defend it, regardless of any evidence that may seem to contradict their position. If I understood the L&P findings correctly, they had measurements of several attributes of sunspots, which over the course of two solar cycles, had seemed to show that they were not related to the level of sunspot activity. In addition, those attributes influenced the visability of sunspots, and the measurement trends (if continued) seemed to suggest that sunspots would cease to be visible sometime during cycle 24. I was left with the impression there would still be “cycles” occuring, but that you wouldn’t see visible sunspots that would mark the progress of the cycles. The phenomena they were measuring wasn’t suggesting that the cycles were getting weaker or longer or stalling or anything like that, just that the spots themselves were becoming steadily less detectable. I am trying to fit that in with your observation that the correlation between sunspot number and F10.7 seems to be shifting. The time period that the correlation seems to have started drifting matchs the period of L&P observations, so the SSN undercount theory makes sense. It is unfortunate that L&P don’t have any baseline data that preceeds the SSN/F10.7 correlation drift. This leaves me with several questions, perhaps there aren’t answers. First, how does this relate to the late start of cycle 24? Perhaps cycle 24 has really already started, we just can’t tell that because we are seeing fewer sunspots, but shouldn’t F10.7 be rising regardless? What am I missing here? Has anyone contacted Livingston and Penn for an update? I realise that there have been precious few sunspots for new data points, but am very curious about whether the few that have occured have shown the same measurement trends observed previously. That’s one fantastic paper Scafetta’s preparing, David, thanks a million. That man’s work shown here is genuine Nobel Prize standard IMO. ?? I’m not sure who posted this, but…. You know the planets have no effect on the solar cycle because of why ? And I’ll put my space weather forecasting history up against anyones around the space weather community for the past 15 years. Now theories are nice but results are what matters. So don’t go judging me or making sarcastic comments when you have no clue about what I have or have not forecasted. Or who has received these forecasts within the space weather community or even outside of it. And I was well aware of where the polar fields were headed and this was why I forecasted a peak of 115 for Cycle 23 and why I had said we were headed toward another quiet period. And can you tell me what person within the solar community had a more accurate Cycle 23 forecast ? And the likes of Dr Jo Ann Joselyn, who worked at The Space Environment Center, received this forecast. And everyone within the field knows who she is. But did she agree with my forecast, or my theories? No of course not because she obviously would not have put out such a higher Cycle 23 forecast if she did. Or I should say the panel that she headed, a worldwide handpicked group of solar experts. Leif, thanks for all of your contribution. It is obviously more than writing the article, but also taking the time to answer questions. Really appreciate it. anna v (12:51:05) My thoughts too. We’ve depended on old Sol for so long, it must be like a cellular memory if there is such a thing. I was impressed by your reference recently in another comment section regarding the placebo effect, something western medicine likes to ignore rather than take advantage of. Another ancient, albeit, pragmatic effect of our conciousness. No. Just an honest individual who forecasts many different things besides Space weather, like the ENSO , Major Stratospheric Warmings, and many other things. Would you like some links to places where I have forecasted these things in discussions well in advance, where professionals within the science community have interacted with me in these discussions, and I have earned their respect ? And is this a science forum where certain people can speak about things, or even forecast things well in advance. Or is this a place where certain individuals are held at a higher level because of the status quo? It is unfortunate that L&P don’t have any baseline data that precedes the SSN/F10.7 correlation drift. Yes, but such is science often. Perhaps cycle 24 has really already started, we just can’t tell that because we are seeing fewer sunspots, but shouldn’t F10.7 be rising regardless? SC24 has indeed started about a year ago, and we have seen the magnetic regions and F10.7 increase from that. The sunspot number has been miserable, possibly due to the L&P effect, so I don’t think you were missing anything. Has anyone contacted Livingston and Penn for an update? Yes, I’m in contact with Bill every time he has a measurement and they have persisted their downward trend [for the field] and their upward trend for contrast and temperature. Before we give him a prize worthy of an Al Gore, he needs to stop using the Hoyt & Schatten TSI reconstruction, and the Solanki model [based on Lockwood’s non-happened ‘doubling of the Sun’s magnetic field], and the PMOD data [Froehlich has admitted to a drift in the data]. Scafetta cherry picks obsolete papers and data that happen to fit his ideas. This is not good science. Yes, Ken Schatten who was on the SC23 panel. His forecast was voted down by the rest of the panel, because the polar fields from Wilcox and Kitt Peak observatories disagreed. We now know [and Ken should have known then] that the noise level of the Kitt Peak data was too high for measuring the weak polar fields [so their result was basically garbage]. Using the polar fields to predict solar activity is correct. This has still nothing to do with the planets. And the rest of the detailed mechanisms of your comment was simply not coherent. What can I say? As a practicing solar physicist with some 40+ years in this field what you held forth with didn’t make any sense to me. Perhaps I’m wrong about this assessment, but as EVERYTHING I comment on, that is just my opinion and you can take it or prefer to leave it [as others sometimes do]. Many people are making a good living selling forecasts based on all kind of things and there will always be a market for ‘alternative’ solutions, simply because there are always people that distrust the ‘official’ ones on principle. We had a discussion about Piers Corbyn recently in another thread, and The Farmer’s Almanac, even my local newspaper has a column that tells me [I’m a Taurus] what’s in for me next week. I don’t think so. You will even find guest postings from such People as David Archibald. This certainly shows that this blog is open to alternative views. Now we know that when the polar strength becomes equal we increase the chances of solar eruptions, coronal holes. So coronal holes are part of the solar cycle development process. And this is why Jack Eddy found out that there was an absence of the northern lights during the Maunder Minimum. [they were not absent]. And the latter [MM} was most likely preceded by a time when the polar field strength was stuck in a much higher continual state, not a much lower state. Even if the current exact opposite state is having a diminishing effect upon the upcoming cycle itself. Try hard as I may, they still don’t make sense [or if I take them literally, they are wrong]. Perhaps you would like to elaborate? >>You need an image processing program. >>And even at that, 1.029 to 1 is a poor contrast even when stretched. But the point is that these micro-spots would not have registered even 50 years ago – so as far as comparisons with the historical record goes, the Sun is still spotless. My polar field comments, as well as what led up to this curent solar state, or what will transpire due to the current state of certain variables, was a generalization of how things indirectly either point toward things, or how they possibly enhance or demise things. Nothing more. As far as everything else. I will leave it alone for now. But I’ll be sure to drop back by with some long range forecasts for you. And they will be somewhat based upon the planetary relationships, just like all of my previous calls. And please contact Jo Ann if you know her because I do not appreciate being called a fraud by the likes of Adolfo Giurfa. Have a good weekend. Jim Hughes (15:56:13) Please don´t take it that way, what i asked, changing a little Galileo Galilei famous phrase, in front of the inquisition, and putting into past tense “Did it move any way?”, to what you said NO. It´s OK. We do not know, yet, if it is ok or not those theories as the one presented by N. Scafetta, among others, but by presenting alternatives, no matter how naive at a precise moment, be it in a conversation or in a blog like this, and even not being so wise and informed as surely you are, can work as an unexpected catalyzer for someone. If everything would be like just “roses, roses” we would, for sure, end in a bee hive or in an anthill, doing the same thing all the time. Excellent article Leif, very educational. I now understand solar F10.7 flux better than I did. I am looking forward to your next guest post (and hoping it concerns UV flux). Leif… I think that we are not trapped by any unscientific idea. Life on Earth depends absolutely from the energy incoming from the Sun. There is no other source of energy for photoautotrophic and chemoautotrophic organisms. We depend, at the same time, from photoautotrophic and chemoautotrophic organisms. That’s why. Wow! That is one responsive author. Thank you for Dr. Svalgaard your article and thanks also for the incredible amount of time you have given in your responses – even the dumb ones like mine (I realized the obvious shortly after clicking the submit button). As a new person in this area of science I have been looking at many ways to gauge the solar output changes. With the current reduction of TSI by 10-4w/m(2) there are many hypothesis for why this occurs. Cloud cover, aerosols, etc… one that we have been looking at is this. In a fission reaction there is always spent fuel (clumped matter). Similarly in a fusion reaction bonds become greater and over time these “clumps” grow in the solar flows and slows the reaction (minutely) much like a control rod in a nuclear reactor absorbing the protons which keep the reaction going. The sun cools slightly and the magnetic tunnels which show sunspot activity fail to surface or are invisible due to cooling. This clumped matter is eventually pulled back into the core. The magnetic signature of activity is there, however the increased UV and Infrared are not, resulting in the decreased TSI of about -1.1%. The decrease in surface disruption slows CME’s and solar wind generation. Polar magnetism is also affected and weakened. Granted .1% is minuscule and hard to track, but would this internal change disrupt the reaction enough to create a prolonged solar minima? Can this minute change in the solar reaction recovery be slowed (lengthened) by simple gravitational pulls (galactic position)? This is only one piece of the complex pie as many others have greater influence but could this be a driving force that triggers others? Thanks again for intriguing article, and for the followup responses. One great thing about the internet is that it allows you to seek out and find information that interests you in ways that weren’t possible before. When the author replies back to questions or thoughts invoked by the article, well, that’s just powerful media, that all. I have two other thoughts based on the article, first, assuming for the sake of argument that L&P are correct about the visiblity of sunspots, will F10.7 completely lose correlation with SSN and go through a somewhat normal cycle, even if no sunspots are visible? Secondly, L&Ps data showed quite a range for the phenomena they observed, the ~2015 date was for a linear average trend, and doesn’t actually indicate that there will be no spots after 2015 (at that point 50% wouldn’t be detected) Is it possible to determine, based on the statistical spread of their data, at what point we would be losing visibility on the “outlieing” data points? In other words, we won’t just suddenly not have sunspots, we would expect to lose first 5%, then 10% etc., the outliers that don’t show up must be equal to the drift in the SSN/F10.7 correlation. Probably not enough data to try to tie the two together though. Based on Dr. Svalgaard’s “first effort”, I assume that your “microseconds of uncertainty” will be in the subnanosecond range going forward? anna v (12:51:05) My thoughts too. We’ve depended on old Sol for so long, it must be like a cellular memory if there is such a thing. I am sure that at some future date such cellular memories will be identified by genes. 🙂 Biology, like climate, is a complex and chaotic field . OT, but you might appreciate it. I have come to the conclusion that there must exist a “pyro” gene, i.e. a gene that likes watching and creating flames, which in its extreme is expressed in pyromaniacs . After I stopped smoking 35 years ago, I found that by lighting a match and watching the flame burn out, part of my desire for a smoke went up :). I kept a matchbox on my desk for a year for that purpose. I now come to think that the persistence of smoking in our culture where, in the EU, they are talking of forbidding it even outdoors! , and despite all the medical evidence against smoking, is due to this atavism. We are the end result of mammals who could light fires. Whoever could not, disappeared. That is the second god after the sun, Prometheus, who stole the fire from the sun. The interbal furnace is very stable sumply because it is so big and because it takes 170,000 years for the energy to leak out, so everything is smoothed with a 170,000 year long filter, so it is hard to get any variations. Helioseismolgy has only very recently begun investigation of the the core and our knwledge is still sketchy. With thr lanuch of SDO this fall we should soon be getting much better data. My thoughts too. We’ve depended on old Sol for so long, it must be like a cellular memory if there is such a thing. Probably not enough data to try to tie the two together though. Although we humans have a set of genes which induces us to think about something supernatural governing our lives, no one of those genes specifies the objects of worshiping. There is no recognizable gene which impels a person to worship a stone rather than a tree, the rain or the Sun. The latter is absolutely cultural heritage and it doesn’t obey to any genetic set or cell memory. Genetics is not a Lamarckian thing. On the other hand, some microstates of bioprocesses are stochastic, but macroscopically they are not chaotic. Many processes in biosystems have been explained through physicochemical principles. The theory of reversibility-irreversibility in climatology is different to the biological description. Climate processes are spontaneous, while life processes are no-spontaneous. All the energy which sustains life on Earth comes from the Sun, and it is the Sun which provides the energy which impedes the ecosystems collapse. Although the Sun is not the only factor which determines the distribution of biomes on the Earth, it is the main one. The distribution of biomes on the Earth depends mainly on the regional insolation, even at twilight zones. Climate of biomes are modified by regional fauna and flora; however, the main climatic conditions of a biome is determined by the Sun, and fluctuations in solar irradiance affect the climate of biomes. Very interesting. Perhaps we’ve had the minimum after all at the end of last year. And today even a small cycle 24 spot. However, there’s another region of some activity coming into view and from its lattitude its a cycle 23 remnant. Actually it has been visible for over a week now by Stereo at at least a similar level of (non?) activity as the current small plague/spot regions. It would be interesting to see if it too has developed a small spot. Though my proposal is very much speculative and tongue in cheek, it is less than the famous gene propagation that was in a decade or two ago. Also I hope that your interest in climate has taught you to never say “never” :). I have been following on and off some lectures on chaos and complexity in disciplines from physics to biology, they are organized by a biologist in the institute and are supposed to be frontier research. Of course chaos in the mathematical sense, not the colloquial. Lucy Skywalker (14:06:27) : Really important Scafetta´s slides and conference. shows that something happened in september 29, 1989. The same year where, as shown above, the discrepancy between f10.7 and SSN began. anna v (21:34:44) I was fascinated by fire in my youth, much to the chagrin of my parents. It took a lot of ‘conditioning’ to keep me from causing a major confligration in their opinion. It was replaced by my first forays into chemistry with sodium nitrate, sulpher and carbon… If I recall correctly, coyote stole fire and brought it to earth in the Native American mythology. Actually, literal genes and physical cells have nothing to do with my reference. My use of “cellular memory” was an allusion to the subconcious mind, which also controls the plecebo effect. Humans hold many faiths and belief systems of which we are not consciously aware. This allows for the spectrum of preference and desire that we engage in. My own perception is that it is our subconcious projected onto our external environment that suggests an object worth worshipping, identifying it as not-self. By researching with his colleagues, Goldberger was able to discover that heart rates show fractal patterns. This is not because of physical reasons, as many might believe, but because of physiological reasons. Nevertheless, those physiological reasons are determined by physicochemical processes; thus, the apparent chaos of heartbeats is deterministic. Chaos refers to two analogous systems which are originated in two points and exhibit a very small margin of difference of their initial conditions; after a long enough period of time, the systems will evolve toward two completely different final states. Nevertheless, in a healthy human biosystem each heartbeat ends on the same expected result, that is, the emission of an electrochemical impulse, the systole and the expulsion of blood towards arteries or veins, although they would differ every so often. From the biophysics point of view, heartbeats would be chaotic if the electrochemical impulse was generated and the result was absolutely different to a beat. Divergences on time intervals don’t necessarily are chaos. Regarding fractality, from the same link, it’s a children’s game. Fractality occurs in the subatomic and/or quantum levels, so it is logical that the macrostructures show some degree of fractality. Nasif Nahle (23:47:32) Actually, literal genes and physical cells have nothing to do with my reference. My use of “cellular memory” was an allusion to the subconcious mind, which also controls the placebo effect. Humans hold many faiths and belief systems of which we are not consciously aware. This allows for the spectrum of preference and desire that we engage in. My own perception is that it is our subconcious projected onto our external environment that suggests an object worth worshipping, identifying it as not-self. It’s seems I misinterpreted your assertion. I apologize. Which cycle does this one belong to? Nasif Nahle (09:13:02) Apology accepted, none really needed, but thank you. Considering the nationalities and spectrum of opinions presented here, I am impressed by how well we do communicate. Today, I projected a small sunspot with a penumbra. It also had a trailing Tiny Tim. The penumbra was very difficult, as was finding the spot itself. The umbra was a grey, halfway between black & white. Still, the first spot I have seen since January. And the 1st SC24 spot I have projected with a penumbra. 11:00 am PDT and 12:30 pm PDT. Steve and Nasif, you must read Candace Pert’s “Molecules of Emotion”. She has a theory about whole body molecular emotional memory for learned behavior, trauma, beliefs, and pleasure, that over time, could be the seeds for genetic brainbased reflexes and instincts. Fascinating read. I tackled it in one day simply because I could not put it down. It is both technical and autobiographical. And she has the chops to say what she says (though she may go a bit too far for me). Pamela, thanks for the reference. Timewise she was a contemporary of Brugh Joy who wrote ‘Joy’s Way’. I don’t know how I missed Ms. Pert’s work. I generally tend toward Jung’s theories. we appreciate you for presenting the data accurately and with little or no bias. Unfortunately you keep presenting the current minimum as almost typical. 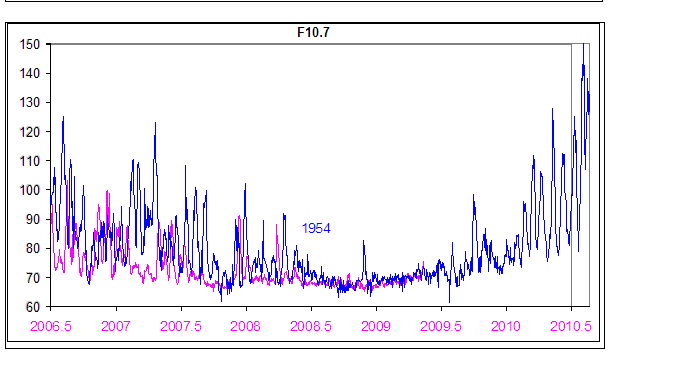 For example, the graph you show of the F10.7 comparing current to 1954 you claim shows similarity. It does not. The current F10.7 has little amplitude excursion from the base, yet, the 1954 data, even during its quietest, has substantially larger excursions than current. ??????? A question. I am still unclear as to the data to allow comparison between the Maunder Minimum and now. That is, the assumption that the lack of sunspots then was caused by the same conditions as now. Is it possible for the magnetic field to have been more quiescent or smooth or for some other causation??? The F10.7 flux is the sum of two components: one is the emission from spots and that is clearly smaller if there are fewer spots. In that sense 2008/2009 is more quiet than 1954, but not by much [2008: 2.9 vs. 1954: 4.4]. The other component [the base level] depends on the density and temperature of the corona which in turn are caused by the overall magnetic field. and that baseline is the same at all minima, and we surmise even during the Maunder Minimum. On the other hand we do know that the modulation of cosmic rays during the Maunder was almost as strong as it is now, so there is evidence that solar conditions were not that different. Some spectral lines are VERY sensitive to even minute changes in temperature. Livingston et al. has very carefully measured the line depth of such temperature-sensitive lines over more than 30 years spanning three solar cycles [Sun-as-a-Star Spectrum Variations 1974-2006, W. Livingston, L. Wallace, O. R. White, M. S. Giampapa, The Astrophysical Journal, Volume 657, Issue 2, pp. 1137-1149, 2007, DOI; 10.1086/511127]. They report “that both Ca II K and C I 5380A intensities are constant, indicating that the basal quiet atmosphere is unaffected by cycle magnetism within our observational error. A lower limit to the Ca II K central intensity atmosphere is 0.040. This possibly represents conditions as they were during the Maunder Minimum [their words, remember]. Within our capability to measure it using the C I 5380A line the global (Full Disk) and basal (Center Disk) photospheric temperature is constant over the activity cycles 21, 22, and 23”. I have known Bill Livingston [and White] for over 36 years and he is a very careful and competent observer. Since the 1960 we have known that the sun’s surface oscillates up and down [with typical periods of ~5 minutes]. These oscillations are waves very much like seismic waves in the Earth [caused by earthquakes] and just as earthquake seismic waves can be used to probe the interior of the Earth, they can be used to probe the solar interior. There are millions of such solar waves at any given time and there are different kinds (called ‘modes’) of waves. The solar p-modes are acoustic [sound waves] normal modes. You one can imagine a frequency increase with an increasing magnetic field, due to the increase in magnetic pressure raising the local speed of sound near the surface where it is cooler and where the p-modes spend most of their time. Of course one can also imagine higher frequencies may result from an induced shrinking of the sound cavity and/or an isobaric warming of the cavity. Another kind is the solar f-modes that are the eigenmodes of the sun having no radial null points [i.e. asymptotically surface waves; II apologize for the technical mumbo-jumbo]. From the solar cycle variations of p- and f-modes [and we have now enough data from the SOHO spacecraft to make such a study] we now have an internally consistent picture of the origin of these frequency changes that implies a sun that is coolest at activity maximum when it is most irradiant. Goode and Dziembowski (Sunshine, Earthshine and Climate Change I. Origin of, and Limits on Solar Variability, by Goode, Philip R. & Dziembowski, W. A., Journal of the Korean Astronomical Society, vol. 36, S1, pp. S75-S81, 2003) used the helioseismic data to determine the shape changes in the Sun with rising activity. They calculated the so-called shape asymmetries from the seismic data and found each coefficient was essentially zero at activity minimum and rose in precise spatial correlation with rising surface activity, as measured using Ca II K data from Big Bear Solar Observatory. From this one can conclude that there is a rising corrugation of the solar surface due to rising activity, implying a sun, whose increased irradiance is totally due to activity induced corrugation. This interpretation has been recently observationally verified by Berger et al. (Berger, T.E., van der Voort, L., Rouppe, Loefdahl, M., Contrast analysis of Solar faculae and magnetic bright points. Astrophysical Journal, vol. 661, p.1272, 2007) using the new Swedish Solar Telescope. They have directly observed these corrugations. Goode & Dziembowski conclude that the Sun cannot have been any dimmer than it is now at activity minimum. So, there is other independent evidence. But, of course, we are still just speculating. My own feeling is that solar activity was not much lower during the Maunder Minimum, we just couldn’t see the invisible sunspots. I have come to the conclusion it took Leif probably more time to reply to all the posting than it took him to write the article. And I would like to thank him for both. Excellent work and an interesting read. I am looking forward to the next publication. Sorry to come to this discussion many months after it has been posted, but aren’t you missing something really obvious here? Microwaves excite water molecules, hence the Microwave Oven. Doesn’t the practical application of microwaves for cooking lend itself to a straight forward conclusion that as the sun increases it’s Microwave output (F10.7 flux), that increase is going to directly affect the water vapor in the earth’s upper atmosphere by heating it? Occam’s Razor would suggest that any increase in microwaves coming from the sun must in some measure heat (add energy) water that it strikes. There are many forms of energy the sun generates, each form or wavelength heats a molecule in a specific manner unique to that compound. Microwaves don’t heat O2, N2 or CO2 to a significant degree, but it does heat H20 very well, that’s why microwave ovens heat food and minimally the air surrounding it. If global warmers are so enamored by the radiative effect of CO2, then by the same reasoning water vapor in the upper atmosphere would radiate heat as well but on a much larger scale when heated by microwaves.